Feiwel & Friends, 9781250191830, 240pp. Gid notices right away that Roona is . . . different. She wears roller skates and a blanket as a cape when she needs to feel strong. What he doesn't bargain for, however, is how far outside his comfort zone Roona will take him as she enlists his help in finding her long-gone father. For a kid who's not allowed to ride his bike more than a few blocks from home, this will be an adventure of a lifetime. Shaunta Grimes has worked as a substitute teacher, a newspaper reporter, a drug court counselor, and a vintage clothing seller. Before writing for children, she published two science fiction novels, Viral Nation and Rebel Nation. She lives in Reno with her family, where she writes, teaches, and perpetually studies at the University of Nevada. 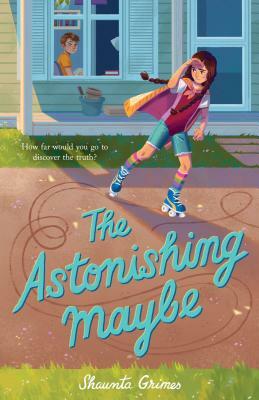 The Astonishing Maybe marks her middle-grade debut.